Posted by Peeps in Food, Home, random stuff. Who doesn’t love bacon? Even vegetarians find it hard to resist. A while ago, Toys found some contest online where you had to make a BLT sandwich completely from scratch. Huh. We have lettuce and tomatoes in the garden. We know how to make bread. Mayonnaise isn’t all the hard to do. So, all we need to do is figure out how to make bacon. How hard can that be? As it turns out, not too hard at all. Last Christmas, I got a copy of Charcuterie from my in-laws. I’d already attempted a couple simple sausage recipes, and I’d had it in my wish list so I could eventually try some harder things. So, we started looking there. 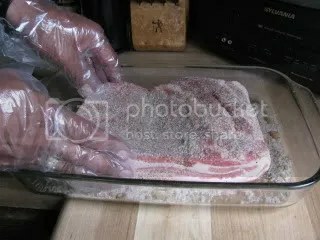 There are a couple of very easy bacon recipes, but they all required pink salt for curing the meat. Sadly, that’s one of the few things we don’t don’t have on hand. And no quick and easy source for it nearby. Ah, well. We’ll order some eventually. Toys looked around online. She found a recipe that looked promising, so we went with it. She had already gotten a slab of pork belly at the Public Market on Saturday. That went into a glass baking dish. 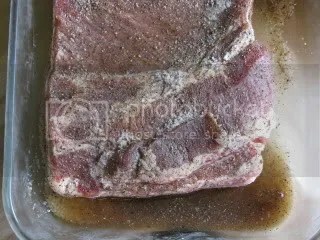 Next, the cure gets applied and rubbed carefully onto the entire outside of the meat. It then gets covered with plastic wrap and put into the fridge. 24 hours later, the liquid that the cure had pulled out of the meat needed to be drained off and more cure applied. And back into the fridge. And so on. Day four arrives. 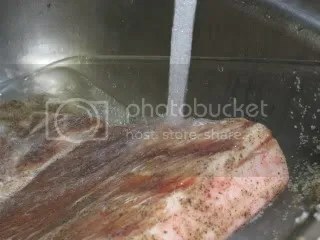 The meat needs to be rinsed off under cold water, and then patted completely dry. And that’s about it. It’s ready to be used. Seriously. 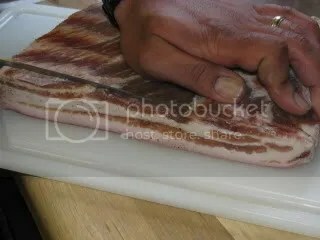 Once we got home and rinsed and dried our bacon, we had to try it. I sliced off a hunk and found a pan. Two things to note. 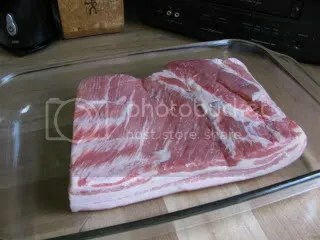 The skin was still on the pork belly prior to us curing it. That’s a good thing. But it’s important to remove it before you try to eat it. It’s a little bit tough. Although, we’re saving the rind in a bag in the freezer, as it may come in handy for cooking with down the road. 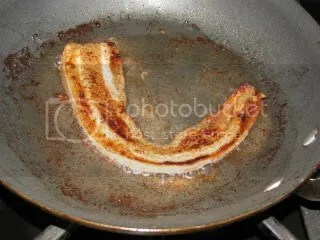 The other thing is that because we did not use curing salt, our final product doesn’t really look like bacon. The color is all wrong. But I could get used to it, I suppose. The verdict? For a first attempt, pretty damn good. It didn’t taste quite like supermarket bacon, but it was good. A tad salty, but we can work on that. I think that with a little practice, we can stop buying bacon from the store entirely. However, I think I’ve still got a long way to go before I can manage to make bacon this good. But it’s good to have goals. I’m submitting this to Home-Ec101.com’s Fearless Fridays because my wife asked me to. After all, we fearlessly cured our own meat. And it was way easier than making our own croissants. Be sure to visit Heather and Ivy for some fun tips and all-around great information and to see what other new things people are working on. You know, it’s funny you said that, because during my brief vegetarian phase I couldn’t *stand* the smell of bacon cooking. During that phase I once found myself on a week-long field ecology course where we were assigned rotating shifts for the cooking. And somehow my shift ended up having the task of cooking massive amounts of bacon for about 40 people. It was one of the most disgusting, unpleasant experiences I’d ever had, since my vegetarianism had progressed by that time to the point that the sight and smell of meat made me ill. And bacon is aggressively meaty. 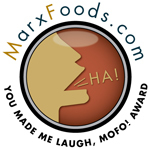 I hope it wouldn’t make you ill. Bacon is supposed to be a joy. It’s a few minutes work a day for less than a week. You should give it a try. Hi cricket! Making bacon was surprisingly not difficult at all! I got the pork belly at our public market – you might want to try a butcher shop or meat market – someplace that actually cuts its own meat.